It is an action you take, either on your behalf or that of a company, to create and reinforce the place you hold in your customer’s mind. A brand is what people say about you when you aren’t around. It is the impression a person has of a company or service and is based on experiences, word of mouth, advertising, publicity, social media, and a variety of other types of interactions that person may have with the individual, company or service. You don’t own your brand. Your customers do. You own the action of branding. But how do you know what action to take? That comes from knowing the story behind the brand. The purpose. The reason the business exists. The WHY. If you are the founder of a company, the reason you started your business is well-known. You have an emotional connection – one so strong it propelled you into entrepreneurship and the life as a business owner. You understand there is a problem which needs fixing and your solution is how it should be done. And you want to help. As an employee, you learn about the brand by understanding the origin of the company, the culture, service expectations, and, most importantly, the role you play in relieving a pain point for your target audience. Regardless of the role you play within the company, you have a role to play in the action of branding. How do your actions reflect on those of the company you represent? If you were the recipient of the action, would you think positively about it? Knowing and sharing your story is key to branding success. If you believe your customers own your brand and you own the action of creating a brand, it is up to you to guide your audience to the perception that matches your brand. Trust and profits are the results. Trust is not a value. And profit is not a mission. Both come naturally and authentically when a brand is built through a consistent and thoughtful act of branding. If you need help with your brand and defining the actions to take to build it to its powerhouse potential, let’s talk. 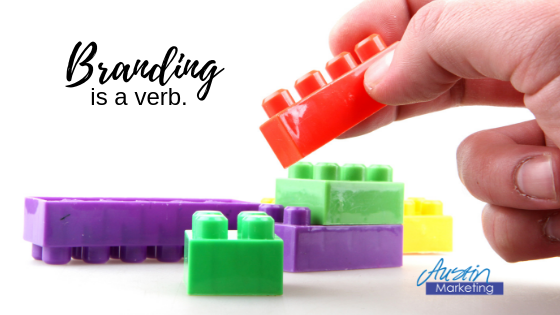 For more on the elements of a strong brand and a complimentary worksheet, read A brand is more than a logo. Many thanks to The Dostal House for sharing this post on their blog. If you aren’t familiar with The Dostal House, here is a bit about them. Created out of conviction, The Dostal House was born because women deserve a place they can “feel at home.” A place where they receive support and guidance to go out and chase their dreams; a place where they feel encouraged and empowered to pursue what sets their soul on fire. Because being a woman is often under-appreciated. We need a place to go where our lives are made easier, a space with limited-to-no distractions, so we can just plain get sh!t done! Along with the brand elements worksheet, you'll get occasional messages from me when I post new content, have new worksheets or offer specials. Success! Now check your email to download your Brand Elements worksheet. Amy Austin of Austin Marketing helps her clients find clarity in their branding, challenging them to look at the core purpose of their business and using that to develop marketing strategies to build an authentic and thriving business. After spending over 20 years in hospital marketing departments, she started her business with the intent of moving marketing and branding from a tedious task and source of frustration to one of business transformation and confidence. She has been included on eVisit's list of 25 Healthcare Marketing Experts to Follow as well as the Top 100 Healthcare Marketing blogs. Let's talk about your current marketing challenges and how I can help. Schedule a call with me today.